Add chicken thighs, 4 cloves of garlic roughly chopped, brown onion roughly chopped, curry paste, 2 eggs, the stalks of the fresh coriander, 1 tsp dried chilli flakes, 1 tsp salt and approximately 1/2 cup of breadcrumbs to a food processor. Blitz until will combined, but not complete mush. You may need to add more breadcrumbs to the mix depending on the consistency of the mixture – you could like it to feel like mince meat by the end. Roll into small balls, I made mine approx 2-3 cm wide so they could be eaten whole. Precook the balls, now you can do this a few ways but I would recommend either popping them in the oven as I did – oven at 180C, place them on baking paper with a light spray of oil and cook until golden, turning mid way through. Or, you can cook them in a pan – make sure the pan is on a medium to high heat and that the pan is well oiled and wiped clean between batches so it doesn’t smoke. Now, for the broth. If you have the time make a chicken stock it is worth it, if you don’t pay the little extra for something good, not full or numbers and made using actual chicken. Heat a splash of olive oil and sesame oil in a pot, add the remaining 2 cloves of garlic crushed and stir until it starts to sizzle, add the stock, using a cooking spoon as a meausre, you know the big kind you stir stuff with when you cook, add one cooking spoon of soy sauce, oyster sauce, 1/2 spoon of fish sauce, 1 tsp of dried chilli flakes, 2 tsp of brown sugar, 1/2 tsp tamarind paste and the juice of half a lime and allow to simmer. Add the meatballs, they should still be warm from the precooking, and whole snow-peas topped and tailed and the red capsicum cut into long strips. Taste the broth and adjust the flavours as needed, the precise measurements will vary every time depending on the flavour of your stock. Allow to simmer until the broth and meatballs are hot and the veggies are cooked to your desired tenderness, I like them quite crunchy so this is only about 2-3 minutes for me. 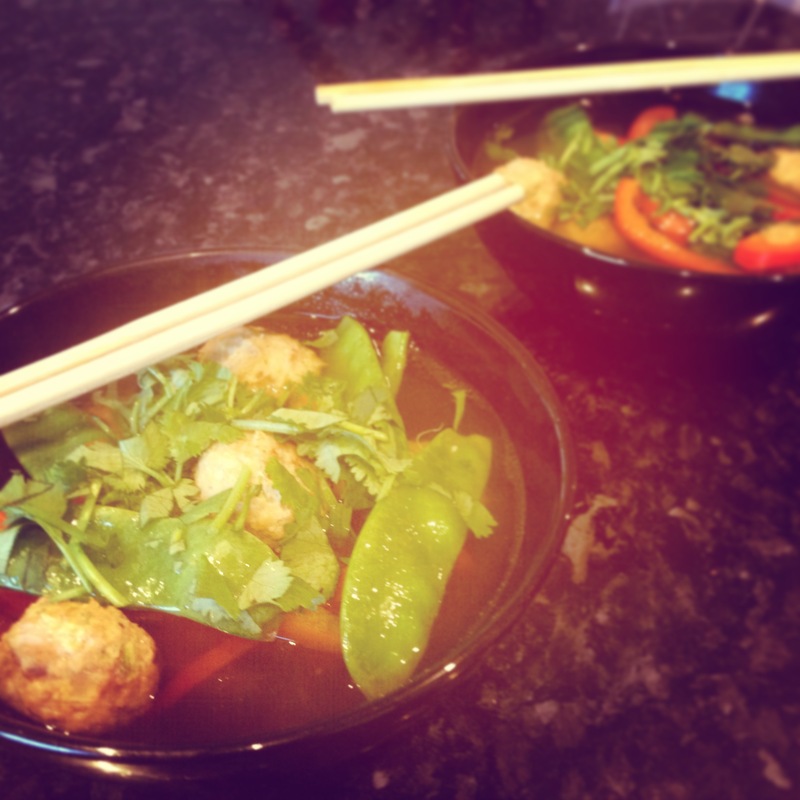 Ladle the soup into bowls, top with fresh coriander and serve with lime wedges. Note: I realise the Thai don’t actually use chopsticks I just like to eat the chunky bits with them and sip the broth from the bowl.